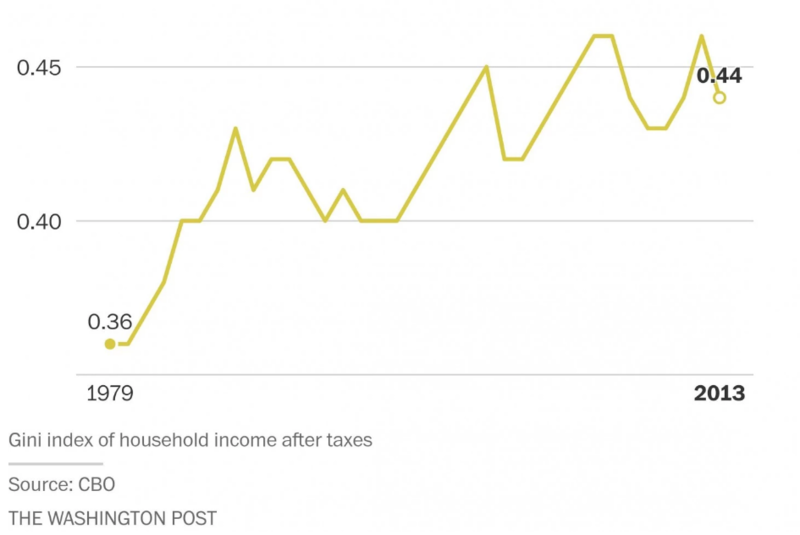 Scooper - Technology News: What impact do higher taxes have on inequality? What impact do higher taxes have on inequality? Income inequality declined abruptly in 2013 after President Obama and Congress negotiated an increase in taxes on the wealthiest Americans, according to new federal data . The legislative changes resulted in the most onerous federal tax system for the rich in almost 20 years. As a result, 2013 was an unusual year for the economy, one of only a handful of years in recent decades in which inequality has decreased, outside recessions. "That decrease in income inequality stemmed primarily from the higher rates faced by high-income taxpayers in that year, which made the federal tax system the most progressive it has been since the mid-1990s," the nonpartisan Congressional Budget Office wrote in the report released Wednesday. There is no clear explanation for the increase in inequality over the long term. Unions have been in decline, and some worry that automation is replacing workers in middle-class jobs in manufacturing. Technology has created a new class of entrepreneurs whose wealth derives from their intellectual property. Whatever the sources of inequality, fiscal policy is one factor that can counteract it, as the new data show. In the final days of 2012, frantic negotiations between the White House and Republicans in Congress resulted in several tax increases for wealthy taxpayers. Tax relief enacted under the Bush administration was allowed to expire. Payroll taxes, which policymakers had reduced to stimulate the economy during the financial crisis, increased again. Finally, a 3.8 percent surtax on capital gains took effect in 2013. The fee, which Congress had imposed to help fund Obama's marquee health reform, was another costly development for rich households with extensive investments. Ahead of this storm of taxation, the wealthy brought in their crop early. They sold off stock and other investments throughout 2012 to realize future income immediately, rather than waiting and paying increased taxes. The result was that incomes for the richest increased abruptly in 2012. The Gini index, a common measure of inequality, went from 0.44 to 0.46. Then, however, the index decreased to its previous level, as the stiffer rates put a check on wealthy households' incomes. Federal taxes reduced the Gini index by nearly 9 percent in 2013, relative to the index based solely on market incomes. The last time that reduction was greater was in 1996. Despite the increased rates, taxation might have become less effective in reducing inequality again since 2013. Income from investments is taxed at a lower rate compared with ordinary income, and because rich Americans realized many of the gains on their investments the year before, they paid a higher rate on average on the other income they received in 2013. As the wealthy make more investments and pay the lower rates on those gains, they will pay comparatively less in taxes — but more than they would have before the legislative bargain at the end of 2012. Going forward, another major question about inequality is the presidential campaign. The plan for taxation that Donald Trump put forward in the fall would drastically increase inequality by reducing taxes on the rich. Recently, though, the presumptive Republican nominee has said he is considering other approaches to taxes.